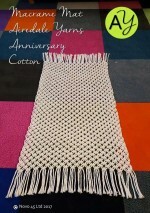 A simple macramé kit to create a chunky knotted mat or rug in a natural ivory cotton. 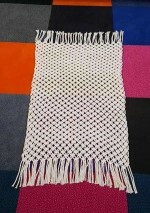 Macramé is such a versatile technique that it can be used for a myriad applications. No longer seen as a 1970’s has-been or just for hippies and spider plants, macramé is cool thanks in no small part to knotters sharing their makes on Pinterest. Essentially this is a pattern for a very simple rug or mat - a perfect runner or bathmat - but it could easily be adapted into a wall-hanging or room divider. 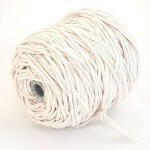 The very thick cotton is quick and easy to knot and once complete the mat could be dyed for a total transformation. The fully illustrated instructions make it clear and easy to follow and once you've got going it's very straightforward. Cotton is absorbent, so this will make a brilliant bath mat, and it's also why it will be so easy to dye. Once dyed you could put it anywhere, though you might not want to use it as a doormat! Though it's chunky you could make it narrower for a runner either on the floor or an a big table! Play around with the knots (it's very easy) to create a wall-hanging or room divider. Buy the kit to make up for yourself or a present, or give as a gift to a crafty friend. Don’t worry about scouring the internet for the right instructions and the right yarn – you get it all here for a great price, and once you’ve started you’ll be hooked...or should that be knotted? It's also a pretty big item from one cone of yarn and your friends will be really impressed!! Beginner. Very simple with just one knot repeated throughout. Scissors, tape measure and way of securing yarn vertically - curtain pole, clothes rail etc.